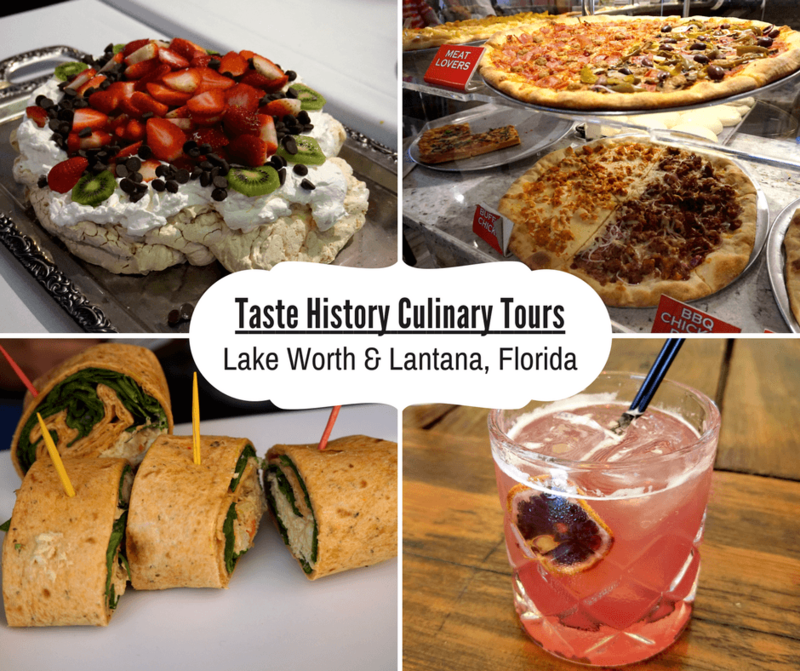 Get to know the Lake Worth and Lantana areas of South Florida with Taste History Culinary Tours, a company that focuses on experiencing a city like a local and offers its guests not only great food, but art and history as well. We try to advocate that travel is always possible (even if you have a full time job) and that you don’t have to go far to have a new adventure. That’s why we were so excited for our mini “Foodcation” in Lake Worth, Florida. Located just over an hour north of where we live, it was perfect for a weekend getaway. We based ourselves in The Mango Inn, a charming and secluded bed and breakfast in the Parrot Cove neighborhood of Lake Worth. This was our first time in Lake Worth, so taking a food tour with Taste History Culinary Tours was a great way to get to know the area. Taste History combines local history, emerging art, and food from family owned eateries. We also knew that we’d enjoy the tour because it was our second time with Taste History (the first was to West Palm Beach). The Lake Worth Farmer’s Market is located on Old Bridge Park along the Lake Worth Lagoon (which means some pretty nice views!) On the day of our vist, there were 62 vendors, all of which were mid-scale local farmers. We were given some time to wander around but the main reason for our visit was Mother Earth, known for its veggie burgers and soups. Next, we were shuttled over to C.W.S Bar & Kitchen. This hip and funky bar is located on Lucerne Avenue, in the heart of downtown Lake Worth. We sat down in their outside garden area which was nicely decorated with plants and hanging lights. It had a very relaxed feel to it, which we really loved. The inside area is called “The Den” and features leather furniture, a fireplace, and an extensive whiskey bar. C.W.S. specializes in cocktails so we were given their popular Figgin’ Around to taste. This yummy concoction was a mix of silver tequila, lime, agave nectar, rosemary, and fig reduction. It was so good, I definitely could’ve had a few more! After C.W.S., the rest of the tour was done on foot (don’t worry, it’s not a large area). We walked over to Java Juice Bar, where commissioner Andy Amorosso himself served us chicken curry wraps and strawberry banana smoothies. It’s obvious that they use fresh and organic ingredients because when we sipped the smoothies it was as if we’d bitten into a crisp cool strawberry. It was so refreshing! Our next stop was Artisans on the Ave, an art gallery on Lake Avenue. This gallery is a co-op that showcases the work of over 40 artists. We spent some time meandering through the space, looking at everything from sculptures to hand-made jewelry. We also got to meet some of the local artists, who told us that the gallery is more than just a place to present their artwork; they also collectively raise and give money back to a lot of local community organizations. Next, we walked over to Brogues Down Under. This local hangout specializes in food from New Zealand, Australia, and Ireland. It’s pub-like atmosphere and distinctive food make the family owned restaurant immensely popular. To start, we were given a plate of Chicken Curry. The curry and coconut flavors were amazing and the chicken had just a hint of spice to it. And although I really liked the dish, I will admit that I did not expect it considering the restaurant we were in. Emily, owner and matriarch of Brogues, must have expected the confusion. She explained to our group that dishes like these were quite common in Australia, due to a large influx of Chinese immigrants to the country in the mid-1800s. Emily also went on to tell us about pavlova, a meringue dessert named after the Russian ballerina Anna Pavlova. The story goes that the dessert was created for the ballerina’s visit to New Zealand in 1926. It is usually in the shape of a ballerina tutu and topped with whipped cream and fruit. We loved how light and crumbly the base was and also how fresh the fruit was. FYI, Brogues is also well known for their awesome buffets! Already feeling a bit full, but up for the challenge, we walked over to our last food stop. Brick Oven Pizza is another local favorite, serving a variety of salads, subs, and pastas. And of course, pizza! We had a few options to sample, but we had a slice of Grandma’s Pizza (a thin Sicilian style pizza with mozzarella, pecorino romano, fresh basil, and extra virgin olive oil) and the Penne Alfredo (with creamy alfredo covered penne pasta, mozzarella, and pecorino romano). We had never had pasta on pizza before, but we are huge fans of alfredo sauce so it wasn’t a surprise to find that we loved the Penne Alfredo. But Grandma’s Pizza was hands down our favorite. There’s just something about that classic style that gets our mouths watering every time! So with full bellies and a new appreciation for Lake Worth, we climbed into the shuttle that had reappeared and started making our way back to the Boynton Beach Mall. On the way, Lori gave us a quick recap of the history of the area and the places we’d visited. We listened, gazing out of the window, content with how we’d passed the afternoon. – These tours are very popular and sell out quickly. Make sure you book ahead. – Tours take place rain or shine, so check the weather and bring necessary items (sunblock, hat, umbrella, etc.). – Wear comfortable shoes. Although the downtown Lake Worth area is not very big, you will be walking from place to place. – The tour is kid friendly (and kids under 14 are free). – The tour cannot accommodate dietary restrictions and dietary substitutions cannot be provided. We were so happy that we had started out our “Foodcation” in Lake Worth with Taste History Culinary Tours. We love that they offer more than the typical food tour by adding in local history and art. I love going on food tours as I feel it really shows you places that yu would often miss. That pavlova looks to die for! Food and history- consider me there! Looks like you’ve had a great tour. Wow, what a great tour! I’m hungry now, hahaha. I love taking culinary tours the places my family travels. I think learning about local businesses and tasting local specialties really helps visitors get to know the places they visit. I had never thought of taking in a food tour close to home though, thanks for the inspiration. Food tours are the best tours! Whenever we go to a new city we try and get on a food tour or make our own food tour. It’s the best way to get to know a city is through it’s food. Great food, art and street art- a dream come true!! I need to head back to Florida! So cool that you decided to take a mini “Foodcation” in Lake Worth – I agree, I think travel experiences are not just about jumping on a 17 hour flight, but also exploring your backyard so to speak! The food tour sounds fabulous, and I love that it combines art and history as well! I think this is a wonderful tower. Especially the Farmers market, where you get to eat and drink stuff made from the fresh and pure produce from the farms. The strawberry smoothie indeed looks refreshing. Good food, some history and art, all blended with a local twist is indeed a heady combo. Food tours or food trips are my cup of tea. I love that you visited some artisan too. I feel like learning about food makes you understand the culture of the country too. I travel for good food for sure. Food tours and farmers markets are two of my favourites. Those hamburgers look delicious as does the pizza and the drinks. I love tours that take you past graffiti art. Great post. Yes, the review is delicious, indeed. Thank you so much Buddy. Love food tours, best way to get to know a place!